This bathroom remodel in Warwick, NY started with a question, “What to do?” The room was dated with the tub / shower failing and the layout, well was far from ideal. The width was a common 5′ but it was deeper than most and it had two doors, one at each end. The solution’s we provided started with the design, needing to stay withing the existing floor area, but looking for how to maximize the space. We proposed the “common layout approach, what you would see in a 5′ x 8′ room but by having the extra depth we would be able to include a custom double vanity and a custom cabinet for storage, all on our clients wish list. To accommodate this we did need to close of one of the doors and shorten the window that would be in the shower area. A couple small changes for the large impact on functionality it made to the space. While the layout may be “common” the finish selection are certainly not and this you know as soon as you open the door to the room. The custom cabinetry and custom vanity with a uncommon custom granite top invite you in. The wood grain tile floor add some richness and warmth to the room with the green, brown and a touch of grey tones. The soft green of the wall and counter keeps the space refreshing for that “spa like” feel. 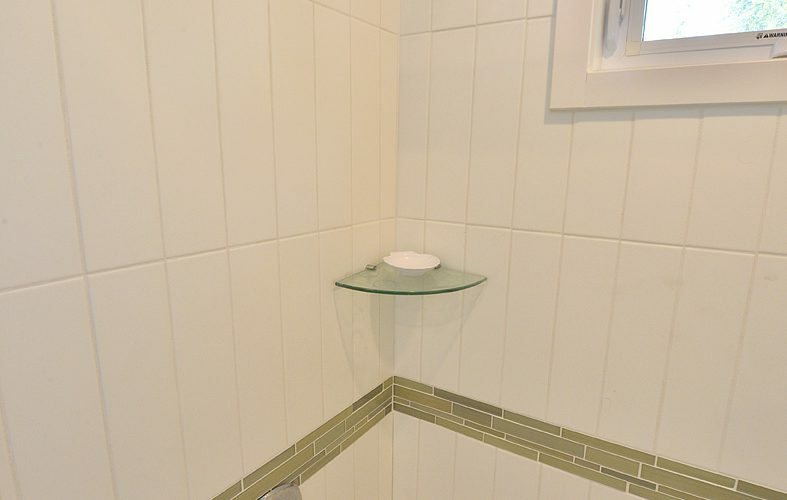 Then above the soaking bath tub we used a modern sized white subway tile with a green glass accent to tie the space together. We love it and so do our clients!